By far, some of the most devastating types of accidents on the road involve tractor trailers, or similar large or over-sized vehicles. 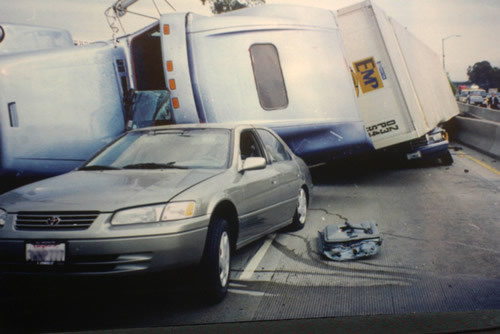 Mr. West has successfully handled many trucking accident cases. Although every case is different, we are confident our work on past cases provides us with the knowledge and capability necessary to handle these matters efficiently and well. We know the experts and we know the law. One case handled by Mr. West involved the overloading and improper tie down of goods within a trailer which, when combined with the driver’s negligent speeding, cause the truck to flip on its side on a connecting ramp between two freeways. Unfortunately, there was a vehicle right next to the trailer when it flipped and the truck landed on top of the vehicle. The people in the vehicle were, thankfully not killed, but the driver suffered major injuries. The case was brought against the driver, the truck owners, the company who loaded the truck and others. Mr. West prepared the case for trial and it settled “on the courthouse steps” on the day set for trial. In another trucking case Mr. West handled, a husband and father was killed on his way to work when an inattentive and speeding trucker failed to stop for a red traffic light and crashed into the victim’s vehicle, killing him instantly. Mr. West, through his efforts, was able to show the traffic light was indeed in favor of the victim and against the truck driver and the case settled for the policy limits on the tractor trailer. In the early hours one morning in San Diego County, a couple, working as a long haul over the road truck team broke down. Lost, they decided to rest through the night and try to get assistance in the morning. They left their tractor, with hardly any reflectors on the side, sticking out into the right lane of traffic. In the very early hours of the morning, in dusk conditions, Mr. West’s clients’ husband and father, heading out to procure food for the military base he worked as a civilian, could not tell there was a truck sticking out into his lane of travel. There were no flares or reflective triangles to warn him. The sparse reflectors on the side of the truck looked like lights from the city off in the distance. The victim could not even slow down, let alone stop, and his vehicle submarined under the trailer, killing him instantly. Mr. West, handling the civil matter against the driver and the trucking company was able to resolve the matter without putting the victims family through the hardships of a trial.